Calgary gets their top line RW. Pittsburgh gets their LD that fits their fast play style. They get a first they can flip and a promising d prospect. Pretty interesting trade. Idk the cap Brodie has but I’m sure it would work out just fine with Kessel leaving. Good post. Don’t want to lose a Kessel but this trade works positionslly and capwise. Brodie would do well in Pitt. For Philly I took out the retention on Simmonds cause he's already on a good contract and took out the AHL prospect cause I felt like he didn't really fit into the Flames plans. For the Flames I replaced Dube with Stone, Mangiapane and Fischer. Philidelphia already has stellar Center depth. Mangiapane is a fast young left winger that they're been looking for and Stone helps their right side d depth. Fischer is a long shot prospect but could maybe make the jump one day. I think its fair tbh. Good post. No from CGY. Fox and Mangiapane are excellent prospects. And why trade next years 1st for a mid 1st this year. Borrow from Peter to pay Paul. Gets you nowhere. Don’t see why Philly needs defenseman tbh they have a pretty good pipeline of dmen. McJesus: Philly is pretty stacked with left side, Ghost, Provorov, Morin, Sanheim, etc. but their right side is very thin with gudas as their only right handed d man and no stand out propsects coming in. Stone gives them another right handed d man that can slot in on the bottom pairing and Fox gives them a right handed top 4 d of the future hopefully. SC4: Fox is a good prospect but he is a bit of a gamble, very boom or bust and with Calgary’s defensive depth and pipeline he may never get a good shot. Mangiapane is a decent prospect but is nothing special. He may make the team next year but with the addition of Simmonds he won’t be missed that much. Assuming Flames make the playoffs next year their pick will likely be around 19 so trading for a 2018 pick will give them a prospect that can step in a year sooner and given that 2018 is a very good draft they’ll probably get a bit of a better player than they would in 2019. We don't need Stone or any other defencemen. Ditto to bottom 6 prospects. I'd rather have a solid prospect with top 6 potential than several depth prospects, hence Dube. Simmonds got 24 goals last year despite needing multiple surgeries. He's a warrior and worth what Calgary would pay. SC4CGY: I didn't pull the idea of Calgary trading into the first round out of a hat. It was reported that they're looking to do it. Since Calgary would probably want to retain their current pieces to compete in 18/ 19, the best way is through trading a future 1st. I’m aware of the Flames management looking to trade back into the 1st this year. But by trading next years 1st they’re potentially in the same position next year. Also I think you underestimate Fox value. And for just 1 year as Simmons contract is almost up. May a conditional 2nd that becomes a 1st if Simmons resigns. SC4CGY: you're correct that they'd lose next year's first rounder but they're not slated to pick until the 4th round this year. At least they have a third next year. Treliving likely wants some type of prospect in the pipe after the draft rather than deferring to next year. It's sound logic but the devil's in what it'll cost. Since Calgary will likely not trade away current NHLers, that only leaves picks and prospects, with next year's 1st being the most likely casualty. To answer you SC4CGY, maybe they're a prospecg they really like in this draft and want him in the pipeline. So for them a firdt this year is more valuable in that contexte. These trades give Dallas a top pairing d man that they need and Carolina a middle 6 center with potential that they've been looking for. It has become quite obvious that one of Calgary's struggles has been scoring and based on the market and Calgary's current assets I believe the best thing for them to do is trade for prospects that have potential to make an impact next year. Both Mattheos and Robertson have shown great scoring ability in junior, have good size, and are RW. Robertson I believe could very possibly make the jump to the NHL next year and be a good player. His finishing around the net and high IQ could pair nicely with Gaudreau and Monahan. Here come the GM's underrating Brodie. Hate it, very underrated defencemen would love to have him on my team but the 2nd trade is off a bit. For the second trade would you say Bennett alone gets more or less? Considering McDonagh got a very late first, an A prospect, B prospect and a 2nd I think this is a fair return for Pacioretty. They are of similar value, however the closer Pacioretty gets to his next contract, the more value he losses. Assuming this occurs in the offseason his value will have declined. Calgary’s 1st is almost equivalent to Tampa’s first and second seeing as usually it’s a late first and late second to move to a mid 1st. Howden carries a bit more value than Bennett (debatable but a topic for another day) and Kylington carries more value than Libek. I don’t think Pacioretty will get much more, if any more, than this. The price for Patches is first rd pick +A prospect. That's too much for Plekanec. A straight 3rd round pick at the most should be enough, or if the Habs prefer a C, D prospect.
. I know I'm dreaming here, but I'd love to see something like what Habs did with Weiss and Fleishman, when they received Danault back. So., a young player who jus needs a home. that would be ideal I think. But your deal is very fair and realistic. I believe I proposed this same question a year ago but I'd like to see how people feel now. In favour of Marner: Undoubtly his offensive ceiling is higher than Tkachuks. He also has show that he can run his own line and lead the offence for his line, Tkachuk has be less consistent when playing with lesser skilled players. Skills wise I'd say marner has the edge. Much more disciplined than Tkachuk. In favour of Tkachuk: Tkachuk is more physical and has a great ability to draw penalties. He is also a good defender, better than Marner at shutting down top lines. He does has a good offensive upside just not quite as good as Marner. I don't watch Tkachuk enough, and I for one love Marner's play style, so I'm going to have to say Marner. Its a good debate though. Tkachuk is indeed becoming like Corey Perry/ Brad Marchand: aggrivating, but with enough finesse, and a good defensive player. Marner, his offensive ceiling is higher of course, but from the many leafs games I've watched, he can make little stupid mistakes - one that I simply think Tkachuk wouldn't take. Imo, if your team is lacking that sort of gritty, hard nosed, skilled player (Marchand, Perry, even Kadri) then you'd probably take Tkachuk (teams like STL probably, or like Chicago) . However, teams lacking firepower (Arizona, Carolina) would probably take Marner. It's a hard one to answer forsure. As of this moment, I will base my decision on last year's playoffs. I don't really remember Tkachuk performance, but I remember Marners. I thought he looked like a a little boy amongst men. (which by age he was). so maybe that is not fair. At this stage in their careers, I'll go with Tkachuk. who is very similar to his father. he had a pretty good run. however, I think Marner has more potential. I just want to see more of him in the playoffs. can he play with the big boys when it counts? There is no denying his ability. just what I seen last playoff concerned me, but this was also a 19 year old kid in his first playoff. so, to early to tell. After last season TSN had Marner in the top 50 NHL players list and didn't have back to back Stanley cup champ Phil Kessel on it. Let that sink in. Now Kessel is a current top three scorer. Yup what’s your point just pointing out leafs Bias? ill take Marner on a Eastern Conference team and Tkachuk on a Western although Marner would be the perfect RW on the top Line on Calgary. Both really good. I think I would prefer tkachuk just to be a bit harder to play against. I see him as being a 60 point player that hits, fights and agitates. He can compete with the big boys when games get tougher. I can see marner being a 70+ point player, maybe 80 even, but clearly gives up a lot in size and strength. Marner had mono down the stretch and in the playoffs last year which is not the only reason he was pushed around, but definitely didn’t help. Much like my Simmonds over pacioretty stance that HABBY attacked calling it habs hating, I’ll take the slight drop off in points for the more physical guy that affects the game in more ways. 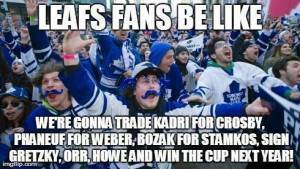 Now call me a leafs hater lol. Hey. Jim, didn't realize he was battling Mono for playoffs. thanks for that info. Yeah @sosa that’s what Babcock said after they were eliminated. Had a shoulder injury and missed 5-6 games and then never really got his rythym back and battled mono. Like I said, not the only reason he got pushed around. He was a 5’11 170 pound kid in his first playoff action. At full health he’s never going to be a physical force, but I would bet on him being much better this year down the stretch and in the playoffs. One thing I've noticed is that the value of Simmonds and Pacioretty on here seems to be quite different, Simmonds being the more valuable one. But to me this just doesn't make sense when I look at the facts. Both are 29, wingers, good contracts both at 1.5 years left (Simmonds is .5 mil cheaper), similar offensive output (Pacioretty has one more point), have leadership qualities and play similar amount of minutes per night. I know not everything can be measured in stats and Simmonds brings a more physical and energy side to the game but for what it's worth Pacioretty also has a physical side (has more hits). Is their value really that different? No it's just most people on here don't like the habs lol. You’re both right. I would take Simmonds over Pacioretty in a heart beat only because power forwards are hard to come by. Otherwise, they both bring a lot to the table. I judge a player by their skill and not by what team they play for. In saying that, I’d take Simmonds over JVR in a heart beat as well. Leafs17 stop it c'mon buddy. Your think the world of JVR and you base all your comments towards your team on you inflated biased. let's get real nig. I have seen both those players play a ton and I would value Simmonds higher because I feel like patches can score with the best of them, but when he isn’t scoring, a lot of the time he isn’t doing much else. You can’t have that from one of your best players (leafs went through that with kessel) . Watching Simmonds, if he’s struggling to put the puck in the net for a period of time, he contributes in so many other ways. Patches is a big strong guy too, so I don’t know if it’s that he’s not capable or just not willing to do what Simmonds does. But for that reason, I’d take him over pacioretty if the asking price was the same. I like simmonds a lot. but I'd be interested to see paciorettys stats if he was on a line with giroux and vorachek. And colt, I don’t see an inflated bias of leaf players when his comment is “I’d take Simmonds in a heart beat over JVR” lol lost me there man. i'd say all three of those players are close in value (if they all had the same term left, JVR as Ufa is obviously much less. ) but Simmonds is the highest, then patches and then JVR. Please back that up Colt. You do know you can look into peoples past posts and replies right? Please find somewhere that I am being bias or even one comment about JVR. Looking forward to hearing back from you. I’ll take patches over Simmonds for sure. Also if patches got to play with much more skilled players, it’s not a guarantee his numbers are better. Sometimes the opposite. You have to work hard, not just be talented to play with star players. Which is why guys like Crosby has his best success with guys like Kunitz, Sheary, honqvist rather than Neal, kessel etc. Superstars don’t need/ want other really skilled players doing too much on their line, they like to control that. they just want a guy that will work hard and always plays consistently. That’s why I think Simmonds has had success with those guys and patches won’t necessarily have the same or more success. It's almost guaranteed he would post better numbers with giroux then say desharnais. Would guys agree that the players are in different roles with their teams? Patches is considered their top, primary scoring player. Simmonds has Giroux, Vorochek and even Coutrerier before him making him secondary support scoring. They are relied on for different things I think. Take that for whatever you want for your argument. I like Simmonds out of the three myself. @Habby, It’s possible, but not guaranteed. I’ve said it before in here. We as leaf fans saw kessel get 35-38 goals 4-5 straight years and I assumed he would bury 50 in Pittsburgh because he would get to play with Crosby, malkin or both. It didn’t work out. Chemistry isn’t a sure thing. Kessel has had I believe mid 20s in goals both years there, not playing with those 2 all the time because the chemistry wasn’t there, but has had better centres than bozak, and yet that’s when he was his best. Jim no matter what is said about anything you can always bring up the exception to the rule. that's a gift man. But in actuality players put up better numbers when they play with good players by a very large percentage. Ppl thought Lucic was going to put up big numbers getting to ride shot gun with mcdavid. Didn’t work, very little chemistry and less skilled maroon thrived in that spot. It’s not one exception to the rule lol if you really need me to give you more examples I can. Patches is a good player. But if he’s your best player, that’s a problem in this league. That’s why I would take Simmonds. He knows his role, he’s very comfortable in it. Not everyone can adjust from being ‘the guy’ to being ‘one of the guys’. Look around the league and almost every single teams best player is better than patches. Many teams have 3-4 players better. It’s not picking on him, it’s true. That has nothing to do with it. The same can be said about simmonds. your essentially saying you would take a lesser player because he's more comfortable in his role. I'd sooner go with the more skilled guy. I guess this is where we differ. Hes saying he wants the guy who will be more successful in the role they will be put in. that's likely Simmonds. Patches doesn't do the secondary things you need out of secondary players and on a competitive, cup contending team he likely isn't the go to guy. Simmonds is proven to be comfortable and capable in a secondary role. In saying they have a different role sorta speak, is not the same as saying they have different skill. They could have the same skill set still, but different role. And @jbs that’s exactly what I meant. Thanks. Patches has been the best player (outside of price of course) on that team for a long time. But he won’t be that on just about any team in the league and certainly not on one that’s going to add him to try to win. His 35 goals are impressive, but he’s been the guy that everyone has been told to give the puck to. If he gets on a team with 3-4 star players, he’s getting the puck 10-20% of the time instead of 50%. Simmonds has been putting up those numbers while knowing Giroux, voracek and more recently coutourier Are options 1-3. You can twist anything around to put a certain player down or make him look like less then he is. you can do this with any player. Put it this way if simmonds was playing on a garbage line with desharnais as his center for years and had a career high 35 points would you still take him over pacioretty. Cause I mean if he can only get 50 or 60 a year playing with giroux and vorachek then he'd never get more then 35 playing with desharnais. See what I did there? Gabby I like u bro. I think we'll get along fine. I was hoping you were going to have something to back your mouth up Colt. I'll keep waiting. I’m saying there’s no guarantee taking a 35 goal scorer to a different situation makes him a 45 goal scorer. Some guys are just 35 goal scorers no matter what, and that’s really really good. However I would much rather have a 30 goal scorer, who will hit, fight, block a shot, stand in front of the net, get in a goalies face, fire up a crowd than a 35 goal scorer who flanks the Wing with a really good release and has been known to be a bit invisible when the pucks not going in for him. But that’s me. Again, I’m not picking on patches, kessel was my favourite player for years, he was very similar. But if I’m building a team, I would sacrifice 4 or 5 goals over 82 games for a guy that shows up and does his job for 82 games rather than a patches/ kessel. The question was ‘why do people on this site value Simmonds more than pacioretty? ” I’m a person on this site and those are my reasons lol deal with it. A 35 goal scorer going to a different situation with better players doesn’t mean he’s going to be a 45 goal scorer. Some guys are just 35 goal scorers and that’s really really good. But I’d rather have a 30 goal scorer who can hit and fight, block a shot, go to the net, get in a goalies face, fire up a crowd over a 35 goal scorer who flanks the wing with a really good release but has been known to be invisible at times when the pucks not going in for him. Kessel was my favourite player for a long time and he’s very similar. But If I am building a team I would give up 4 or 5 goals over 82 games for a guy that shows up and does something to make an impact every night over patches/ kessel. The question was “why do people on this site value Simmonds higher than pacioretty? ” I’m a person on this site and those are my reasons lol deal with it. We were asked why people on this site value Simmonds more than patches. I just gave my reasons why I do lol if you don’t like it, you don’t have to. I have nothing personal against paccioretty, but it’s my belief that a player that does more things is more valuable than a one dimensional player. I’m with leafs17 in saying that he’s far more valuable than JVR also, because JVR is one of the best in tight around the net, but doesn’t do much else. I’ll take a guy at similar age, similar cap hit, similar (although slightly lower) numbers that shows up 82 games and 200feet. I’m saying if Simmonds got to be the guy that all the offense went through like pacioretty has been, he may even have more goals. Again, not a guarantee but a possibility. Rick Nash in CBJ was another. Had pretty good numbers but people always thought if he could get out of there (where he was by far the best player) he would be great. 6 years in New York and only once did he top his worst seasons point total from Columbus. Why?! He wasn’t getting the puck ALL THE TIME. I know you will say that’s the only exception to the rule AGAIN, but that argument starts to wears thin. That's fine jim. But pacioretty has more hits and plays a 200 foot game at least as we'll as simmonds IMO even better. I agree simmonds is the better fighter but who even fights these days? I guess by the logic your using you would rather have laine over Matthews too right? No lol that’s a terrible comparison. Matthews is a top centre. Laine is great winger. Pacioretty and Simmonds are both wingers who score. I, and just about anyone who has ever seen a championship team built, would take a #1 centre over a winger. Good thinking. Way to make my point. You aren’t making this logical at all. You’re making it a team bias thing. Which is why you won’t let my opinion that Simmonds is better than a hab stand, and why you make it about Matthews lol. Sorry I think I hit a nerve there. ok we'll try this one. By your logic eichel is better then Matthews? . Why is Eichel better than Matthews by my logic? I’m really confused now. Is Eichel a physical player? Does he go to the dirty areas more than Matthews? Watch the YouTube video of Matthews 44 goals from last season and see how many are within 5 feet of the crease. A lot are. Or banging in greasy rebounds. I don’t get what you’re trying to show me here. I like Simmonds over patches because of the physical style he plays, the parts of the ice he goes to, and that he does all the secondary things. Are you saying Eichel does more of those things than Matthews? I really don’t see where this is going. All that tells me is that it didn’t matter what anyone said or how much sense they make, you were just going to make it that people are picking on your team. Now trying to flip it to be about Matthews shows that you’re just a small minded habs fan that thinks the world is out to be mean to you. I don’t get how that’s using my logic. Matthews is a 200 foot player. Is Jack Eichel tough and I didn’t know it? Lol does he play a far more physical game than Matthews? Lol does Matthews not show up every night and Eichel does? Does Matthews not go to the net? (Watch the YouTube video of Matthews 44 goals last year and see how many are banging in greasy rebounds or deflections a cpl feet out from the crease) a lot. Don’t get what you’re trying to say there. All that tells me is that no matter what logic was used or what sense was made, you were just going to play the victim and say the world picks on you. Calgary clearly has a lack of scoring. Our defense and goaltending has been lights out only letting in 3 goals or less in the past 19 games. Of those games we've only won 11. And of the remaining 8 losses, 5 have come in OT or SO. We need an extra offensive kick that'll help ensure our spot in the playoffs. Who should the Flames target? Kane, Vanek, Nyquist, other? I’m not a Habs fan, but I am a price fan and I think it’s unfair to throw him under the bus. He clearly hasn’t been the same as was the past couple years, but it starts with the team in front of him. glaring holes on defence, lack of a top center and patches not scoring and in my opinion he’s shouldn’t be the captain. They just don’t play like a team and their defense or lack there of, is catching up them. If you can’t defend you should at least score slot and they don’t have the fire power that even mediocre teams have. My bad, that reply was to the post above. Don’t know what happened there. All good Mertle. I'm the King of posting in wrong area. Not sure Tampa is looking to trade Point. His production for cheap and controllability is too valuable for them. Maybe theyd move Johnson in a deal like this but he obviously doesn't have the same value. Could see Koekkoek Johnson Stephens and a pick or something dunno if Carolina would take that though. Not sure why Bolts would even consider this. Point is a really good player, young. and cheap. Point is cheap for now but looking a year ahead they have to sign him and Sergachev each of which (it they continue their current growth) are easily worth 6+ mil. No way they can afford this. Anyways they already have a great center core but when looking at their defense it isn’t fantastic, they could definately use another puck moving d man and Faulk is right handed, something they lack. Also Faulk is signed for under 5 mil. Point is after next season. Sergachev the year after that. Doubt either gets 6+ in rfa honestly. Kuch Johnson Hedman Palat etc. All didn't in their second contract. Callahan is off books by the time Sergachev needs a contract. Girardi Coburn Stralman in time for Point. Tampa is in a much better cap spot than people are giving them credit for especially if the cap goes up. If they trade a center itll probably be the guy Point replaces (Johnson) not Point himself. Johnson struggled at center this year as well their center depth exists but they don't have a bunch of sure fire top 6 guys. jbs you're really good at this, I agree with everything you said. Also, there's Killorn who'd def go before Point does. Jbs, I agree with you but if Sergacheb continues to dominate he will be asking for 7+ million even as a rfa. he's just that good. No he won’t look at his TOI + his useage in his own end is limited. 3 points in his las 12 games on a team as easy to get points on as tampa isn't really dominating. Sergachev has been great but he's got a lot of learning to do still especially in D end. People said Kuch was going to get 7+ on his last deal and he got 4.5. If he gets 7 something might have to be done but i still think that's Johnson/ Killorn before Point. If cap increases like Bettman says i still think itll be ok.
Gabby ypur just mad that we traded him for Drouin lol. The difference between 3 and 4 is greater than a 3rd round pick. There’s a drop off after 3. Yes but teams are going to be careful when trading for him, he just came off an all star season and yet the team is looking to trade him. What does that say about him? While he is an amazing player there have been multiple reports that he is lazy at practice, puts his own personal goal scorer above the teams welfare, and doesn’t get along with the coaching staff. That could drive a lot of teams off. Again he’s one of the best wingers in the league coming off a great season but his value is likely brought down by his actions off the ice and in practice. Hard to see Hanifin going to Vancouver without a high value player like Juolevi, Pettersson, Lind, etc. coming back. Zero chance Calgary trades Smith for that.